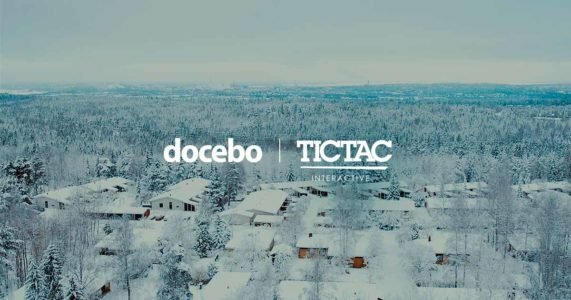 TicTac, a Nordic-based company, can now, with their international partner Docebo, widen their offerings to their customers with more advanced and innovative solutions. Docebo is the global learning platform technology leader bringing innovation to the industry with artificial intelligence, social learning (Coach & Share) and skills management (Perform) module. Digital learning technology (edTech) is the fastest growing industry in the world set to reach $252 billion globally by 2020 and Scandinavia is on the leading edge of the development. TicTac aims their strategy at cooperation with innovative companies that are leading their industry in order to ensure quality, development, and growth with a continuous relevant offer to their customers. Docebo is changing the way people learn with artificial intelligence. While traditional enterprise learning technologies have dictated the way people learn with formal courses pushed from the top down, Docebo’s AI Learning Platform facilitates personalized and automated learning experiences in the flow of work to drive growth, organizational performance, and revenue. Docebo is designed to power a cohesive L&D strategy, and has been embraced by more than 1,400 companies around the world for its ability to satisfy multiple use cases for both internal and external enterprise learning. TicTac is the leading supplier of EdTech for Business in the Nordic countries. With 300 000 users globally – TicTac provides knowledge solutions to make businesses, organisations, and people grow. TicTac provides platforms and services for a global market.